5 bar gate with diamond & vertical braces. 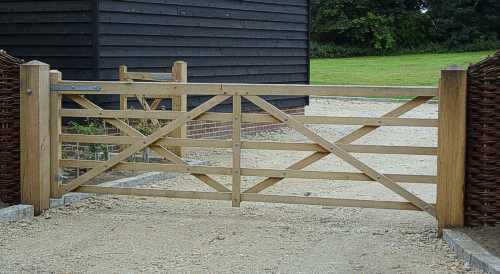 A 5 bar gate with 1.2m high stiles. The above gate in is Iroko with matching Iroko Post and 3 Rail fencing. The photo right shows the same gate in Oak. Kennett gates look good as singles, equal pairs or matched with smaller pedestrian gates or co-ordinating fencing. 1.83m wide gates and under have no vertical support. Kennett gates are available with a solid base rail which gives an equal look top and bottom. The solid base rail also makes the gate more suitable for automation if desired. A solid base rail can be seen here where the Kennett gate is made in Iroko and displayed with co-ordinating side panels and below is the same gate after finishing in Danish oil. 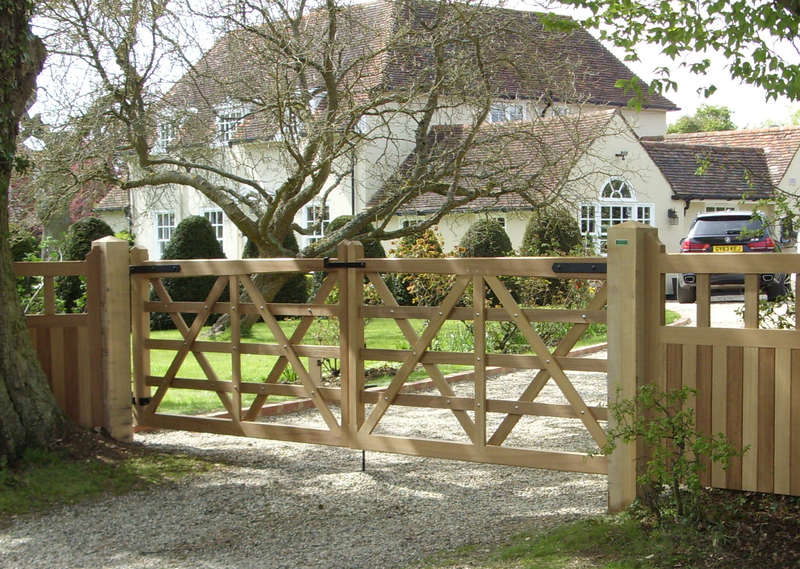 Here the unequal pair of Oak Kennett gates also both have solid base rails and the main gate has been automated. Finished with a section of Oak picket fencing. The different types of timber have different properties. Please refer to our Timber Information pages for explanations and samples of the different timber species. Do you require a Solid base rail? Countryside gates offer a range of installation services within Suffolk and the immediate surrounding areas. If you would like a quote for installation of your Kennett 5 bar gate please contact us. 5 Bar style & Driveway Gate Fittings. 5 Bar style Gate Fittings. Copyright © Countryside Gates, 2016-2019. All rights reserved.